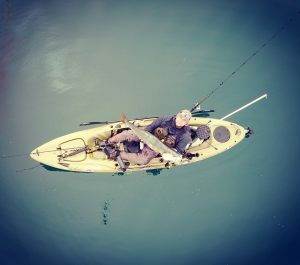 As a very competitive kayak fisherman, I travel all over California looking for new and interesting places to fish. 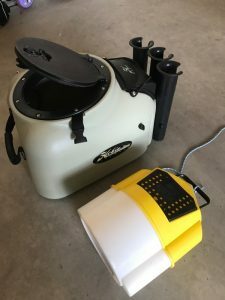 Before deciding where I am going to fish, I carry out a large amount of preparation and research. During this time I talk to other members of our club to see if anyone is interested in joining in the adventure. With this trip, which I was planning the end of February beginning of March, I decided to attempt for some of those elusive White Sea Bass aka ghosts. Anytime I make plans to fish the San Diego area I know Paul Williams is always down to go, so I called him up months in advance to let him know. Just as I thought, Paul was down to join. First thing I typically do is decide when the best time to go fish for the species that I am targeting, in this case ghosts. White Sea Bass start arriving in La Jolla at the end of February, beginning of March. Once I narrowed this down I looked at the moon phase calendar, in search of that full moon. Sea bass love feeding on squid and squid come out during this specific moon phase. After looking at the calendar, it showed that March 11th-13th would be the best time. Now that the days were decided, it was time to book the room. I always attempt to find rooms as close as possible to the launch site and I also look for rooms with kitchens/dining areas. I do this because you can save a lot of money bringing your own food and cooking in the room. I also don’t want to be a hermit, so I also look for rooms that are near things for me to do. In this case I decided on the Residence Inn, located in La Jolla just 5 minutes from our launch sight. This place also has a kitchen and is in walking distance from the Rock Bottom Brewery. Finding the perfect place, I booked the room two months in advance. When booking a room, remember if you are a AAA member be sure to mention it because most places give a discount. In my case, I work for the state of California so I get killer discounts as a government employee. I like placing all my gear into one large rolling case and I encourage the other guys to do the same. It’s amazing how out of hand your gear can get not having it in one area. It makes traveling much easier. Finally the time came for the trip. The fish are there but are few and far between and the trip seemed like it was going to be a tough one by the sounds of it. Paul and I left from my house in Coalinga and made our way to Bakersfield to check out the Fred Hall show. 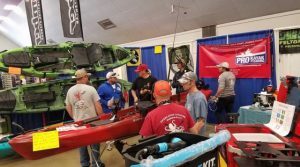 Pro Kayak Fishing had a booth there along with Central Coast Kayaks and Felton Lures. Daniel was going to meet us in La Jolla due to being at work in Palm Springs and Brian was also going to meet us out there due to needing to be at work on Monday. Paul and I made it to the show and spent some money, not hard to do when two addicts arrive at a show filled with their addiction. We stopped by the PKF booth and visited awhile before we left straight to La Jolla. We were back on the road at 12:00 pm and made it to La Jolla around 6:00 pm. Once in the room we started setting up our gear for the next day and waited for Daniel to show up. 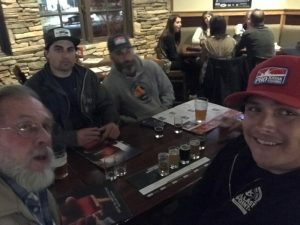 Once he got there, we walked over to the Rock Bottom Brewery to meet up with some of my local friends and Brian. I highly recommend this place for food and beer, try their mosaic beer. We stayed out till about 11:00 pm then headed back to the room to get some much needed sleep. 4:15 am alarm……ugh we lost an hour of sleep this night due to the time change. We got into the car and headed for the launch only to find that the beach access was closed. I normally bring wheels to tow the kayak but I didn’t bring it this time because we had never had to use them in past as La Jolla is known for its drive on beach access. We ended up driving over to the parking lot and had to carry three kayaks and all our gear over to the beach. The new launch site waves were much more aggressive than our normal spot, so getting out was not going to be a dry one. All four of us launched in the pitch black because we wanted to be outside the marine life protected area or mlpa that La Jolla has by grey light so we could start making bait. When catching bait out of La Jolla, I recommend catching as much as possible due to those smart seals out there. Those seals see kayaks as grocery carts filled with food and can be fairly aggressive to get your bait but they mostly steal them off your hook. In one case I had a seal dive close to 85 foot of water and took my bait. I have also noticed that they start leaving you alone around 10:00 am, it’s almost as if they are full. Once the bait was in the tank, it was time to find our fishing spots. We cruised around looking for marks and depths. Rumor has it that the fish are around 120 foot of water. Our group of four fished all over with no luck. Daniel and I ended up heading out deep trying to get away from those seals, but that didn’t work and Daniel and I lost about a dozen greenbacks to those sea dogs. We both decided to head back towards Paul and Brian and just at that moment I received a call on my radio from Brian letting me know he “got one”. We were stoked for Brian being that this was his first WSB and first fish out of La Jolla. We made it back to Brian finding that he landed a 25-30 pound WSB. We took some pictures of his fish and continued fishing. The rest of the day was a bust so Daniel, Paul, Brian and I decided to head back in at about 1:30 pm. It was a long ride back to the beach so we decided to troll baits back. We made it to the outside of the surf around 2:30 pm only to find a lot of people on the beach and some abnormally large swells/waves. This was concerning for the possibilities of having a yard sale. So we had two choices, go for it or head south about a 1/4 mile and drag the kayaks to the car. The group decided to go for it, which was a mistake. Brian went more south to land his kayak where the swells were calmer. Daniel went in first following the swell in, all looked well but he had to jump ship early to avoid swimming and potentially losing gear. Paul and I sat back and watched the timing of the swells, thinking the large ones passed we decided to go for it only to find the large ones were next. Paul was ahead of me by about 20 yards when I looked back and saw a very large wave. In the past I have had great success avoiding dumping my yak by paddling hard back into the wave, so that’s what I attempted. Somehow I was able to make it to the backside of that large wave but the wave was so steep (both front and back) that when I made it over the wave it tipped me over the back tossing me into the water and flipping my kayak. Before I knew it, my kayak was in the middle of another large wave and myself. I knew if I didn’t go under the kayak and wave, I was going to be badly injured. As the wave hit I dove under as far as I could go covering my head, my PDF immediately brought me back up causing me to hit the bottom of my kayak. Once that wave past, I noticed that Paul had also flipped but way closer to shore so Daniel was helping him as fast as possible so that they could come out and help me. Seconds later another wave strikes. 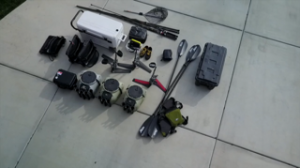 At this time I started attempting to grab my gear finding that camera mount broke off my kayak and all my rods were off the boat. I was able to grab multiple items only to get hit again which caused me to drop all the gear again. I had to flip the kayak over so I focused on that. I was able to flip it and by this time both Daniel and Paul were there to help me out. They started throwing gear into the kayak as I started to gather items that were sinking or drifting away. In the end I lost two rod and reels out of four. I later was able to find one of the two missing rods. I have never really tied my gear down but that is a risk I have always been willing to take knowing it may cost me. But like they always say, tie down your gear as if you are going to flip. As for my well-being, I ended up with multiple cuts and bruises, pulled muscles, and a sore back. This event could have been a lot worse if Paul and Daniel weren’t there, so always try and fish with a friend. Regardless of how this trip ended, which was lost gear, injuries and one fish between all of us, it is always fun heading out with great friends to fish. The stuff that took place is always a possibility and every time I go out I am aware it can happen. So with that said, be safe out there and make wise choices. I didn’t let this discourage me. In fact, we are already planning our September La Jolla trip for yellowtail. Thanks for reading guys check out Ryan Arguello’s Instagram page he is always posting some cool photos. When coming in on big surf try reversing in we find it’s easier to paddle into big wave a not surfing in.